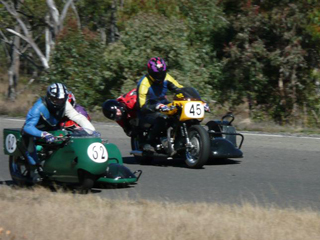 Sidecar racing is both lots of fun and spectacular to watch. Unfortunately our numbers, especially in the historic class are very small so I hope this article may generate some interest. If anyone has ever considered they would like a “bit on the side” then give me or Tony Jacobs a call. You will find that that there is a great deal of comradeship within the sidecar fraternity and we are all only too willing to help. 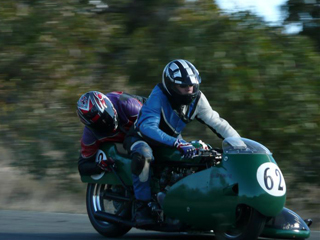 The photo is of my Triumph powered outfit and was taken at Stanthorpe at our annual “brass monkey” meeting in June/July this year. Frame: Homebuilt copy of a Norton Lowboy. Engine: Triumph pre unit with 750 Morgo kit fitted. Gear box: Triumph five speed. If you’re not interested in building or racing an outfit, but would like to have a swing, please also give us a call, as we are often looking for new passengers.